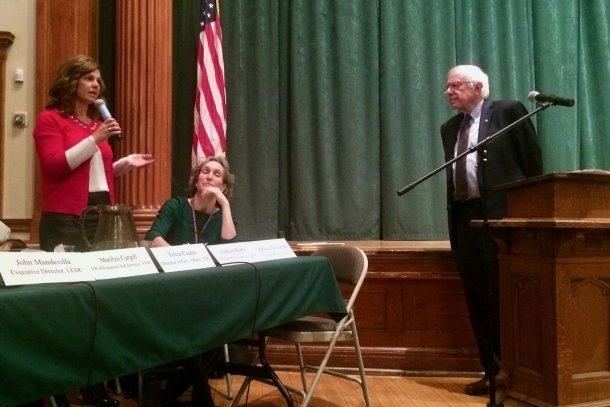 MORRISVILLE — Sen. Bernie Sanders gave himself and others an “F” on Monday for not providing high school students enough information about financial assistance for college and apprenticeship programs. Afterward, Sanders said an information gap existed. A panel of experts, including Education Secretary Rebecca Holcombe and Labor Commissioner Lindsay Kurrle, was on hand. Marilyn Cargill of the Vermont Student Assistance Corp. said there were numerous ways to learn about financial aid, but “obviously we could be doing a lot more just based on the number of hands being raised” with money questions. She said programs are coming up that will provide information. On a positive note, many of the students had participated in the Governor’s Institutes of Vermont program, where teenagers can take courses on college campuses. Many had also taken advantage of the dual enrollment program, where they can get college credit for a course they take while in high school. Sanders stopped himself several times, saying he didn’t want to make his comments too political, but he criticized the federal government for charging interest rates on student loans that were too high and spoke of the value of a free college education, a program he has pushed. Sanders said he had met students with loans of $400,000. Later, Sanders said he was concerned that Pell Grants, a federal subsidy for students with financial need, would be cut to help pay for the tax cuts. Judy Bourbeau, of the Vermont Department of Labor, said many apprenticeships are available, particularly for budding electricians and plumbers. Sanders laughed when a student said he was considering politics for a career, and he reassured a ninth-grader who said she hadn’t decided yet what to do. “First of all, if you’re in the ninth grade, you don’t have to know. It would probably be a bad idea to be certain about what you want to do,” Sanders said. He also said the public needed to overcome the stigma that a college education was better than pursuing a career as an auto mechanic. “If you think being an auto mechanic is not an important job, talk to somebody whose car breaks down in January. You’ll find out that’s a very important job,” he said. When a parent said the younger generation was coddled and needed “trigger warnings” and “safe zones,” almost all the students nodded or agreed out loud, though about half of the students said they had outside jobs. Student Alex Grant spoke for the group.